Do you long to deepen your prayer life? Do you have a heart for social justice? Are you a seeker of peace and reconciliation within yourself and those around you? Then the Society of the Companions of the Holy Cross(SCHC) might be just what you are looking for. The Companions are eager to share the riches of their prayer, service and community. The Society of the Companions of the Holy Cross is a spiritual community of lay and ordained women in the Episcopal Church. We are a quiet community among the many spiritual organizations of the Church. The Companions were founded in 1884 by Emily Morgan and her friend Adelyn Howard. Adelyn was isolated by infirmity and longed for a spiritual companion. What began with seven women has grown to over 700 worldwide. From one friendship came the “sacrament of coming together” for shared prayer, encouragement, and directed service. Today we come together to focus on three themes: the unity of all God’s people, God’s mission in the world, and social justice. Each Companion lives and serves in her own parish community but draws strength and inspiration from the Society. Lenten Retreat 2019: 'Where Are You, God? When life Challenges Faith"
The Society of the Companions of the Holy Cross offered a Lenten quiet dayon Saturday, March 30 2019 on on James Island. The photo album below was taken during this all-day retreat. 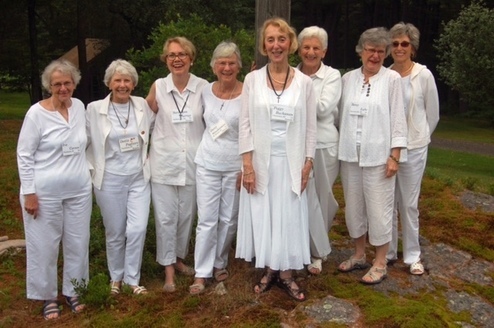 Peggy Brown Buchanan (fourth from the right, above) was admitted to the Companionship at Adelynrood, the SCHC Retreat and Conference Center in Byfield, Mass. on July 25, 2015, with seven of the Palmetto Chapter Companions among the group of 80 Companions who welcomed her. For more information about the SCHC and its Retreat /Conference Center, go to www.Adelynrood.org. View a slideshow from the 2015 retreat below. The Palmetto Chapter is the SCHC chapter in South Carolina. We meet on the second Thursday of each month from 12:30-3:00 p.m.